The Lit Bug Festival was organized by The Story Station on 29th of April 2017. 101 children from Door Step School's centers across Pune city attended and enjoyed the activities, such as songs, dance, and story telling sessions at the Fest. Children also explored variety of books kept on display. 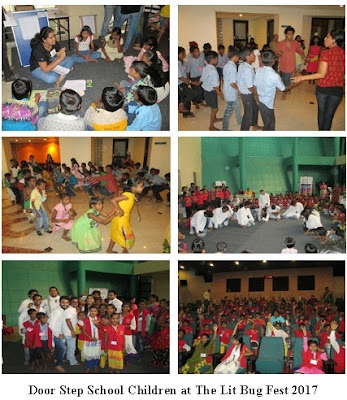 Special features of this year's Lit Bug Fest were Nukkad Natak and children's theatrical plays, by Akanksha Rangabhoomi and Pushkar Rangmanch. We would like to thank the organizers for giving our children an opportunity to experience and enjoy this innovative festival along with other children in the city!